COLORS, LOGOS, AND SHAPES… OH MY! If you are planning a national tour, film shoot, or special event with a unique twist, let us help make your event extra memorable. 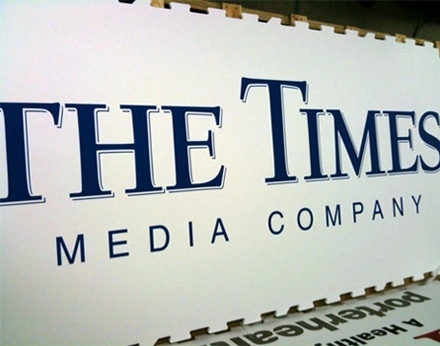 Artificial Ice Events now offers custom printed ice panels. This new technology allows us to make any ice surface your very own including any design, logo and color applications. Printed right on the ice skating surface, this treatment creates the same effect as a professionally painted NHL hockey rink. Imprinted ice panels have been exceptionally well received on the sponsorship level. Many municipalities team up with corporate sponsors and offer custom designed ice panels in return for sponsor dollars. This is a win-win situation for all as it helps provide media value and exposure for the donor while helping to offset the cost of an ice rink installation. The possibilities are endless with customized ice panels from Artificial Ice Events from featuring a new logo design daily by just changing out a few panels, promoting a specific consumer brand at a highly publicized event to creating unique colors and motifs for high end corporate gala’s that coordinate with any party theme! 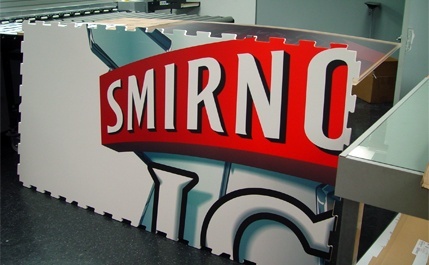 In addition to custom colors and imprinted panels, Artificial Ice Events also offers custom shapes. Many film professionals rely on our ability to make an artificial ice surface fit any specifications. At a recent Budweiser commercial shoot, Artificial Ice Events provided custom panels that fit inside a uniquely shaped pool. 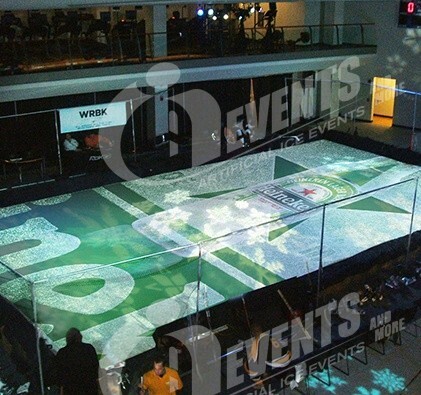 For another client, Artificial Ice Events provided an ice surface in the shape of the company logo. Our only limit is your imagination and Artificial Ice Events lets you be as creative as you want! The novelty of a synthetic ice skating surface is super charged when combined with custom colors, custom logos and custom shapes. Ask us how we can add value to your ice rink rental.